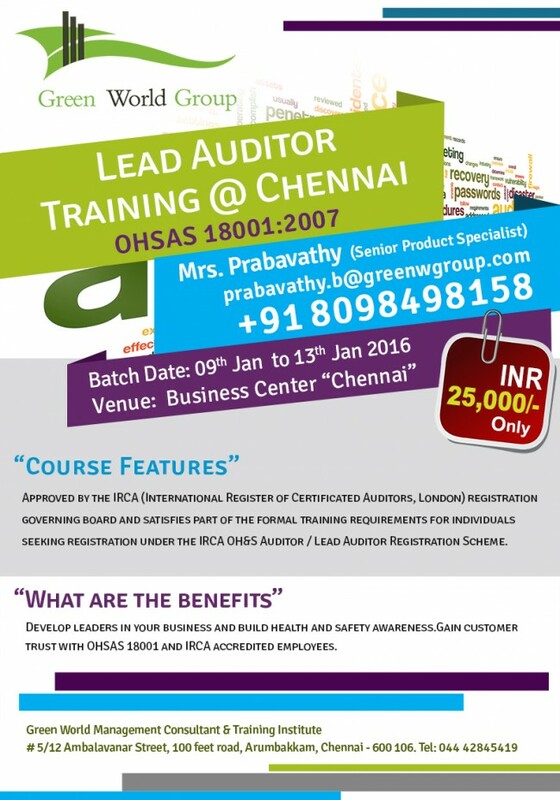 Green World Group provide special Offers for IRCA approved Lead auditor training course in Chennai, India at affordable cost.! GWG is the world leading safety training provider and management consultant which is offering safety training certification courses. We are having our branches in India, UAE, Saudi Arabia, Nigeria, Angola and Oman. IRCA-certified training helps a candidate to demonstrate their competence as an auditor and to achieve professional significance as an IRCA-certified lead auditor. Green world group guide to improve your safety skills to you upgrade in safety industries. BATCH STARTING — 09 th Jan to 13 th Jan 2016. VENUE : Business Center “Chennai”. 10 days Comprehensive Class Room Training. Complimentary E-Learning access with free standard book Materials. # F-91, First floor, Fantasia Business Park, Plot No.47, Sector 30A, Opposite to Vashi Railway station, Vashi, Navi Mumbai – 400 703, Tel: +022 27814626. Mobile: +91 7208518616. Email: info.india@greenwgroup.com.